Can you feel the crispness in the air? It is early autumn; school is back in session and many of us get the urge to organize and be more productive around the house (in between football games and great tailgating parties, of course). As you work around the house this month, here are a few things you should do in preparation for colder months ahead. Check around doors and windows. Weather-stripping comes in a variety of forms: foam, plastic, felt or metal are the most common. Over time, it deteriorates. To keep the cold air from seeping into your home, take a look at the weather-stripping and caulking around your windows and doors. If it is cracked or torn, replace it. Attic insulation inspection. Now that the temperature is a bit cooler, climb up into your attic to inspect your insulation. If you have pink insulation, the pink side (not reflective side) should be facing you. Look for places where the insulation is compacted; those are places where you’ll want to add more. Also look for wet spots, which are a telltale sign that you have a leak in your roof. Now’s the time to get it fixed before winter comes. Check gutters. Do a quick visual inspection of your gutters and drains to make sure they aren’t blocked with debris and are solidly attached to your home. Note that this is something you should do regularly throughout the year. Keep mice out. Mice can squeeze through an opening as small as ¼ inch, and autumn is the time they are looking for a winter home. Make sure your vents are screened and that there aren’t any gaps around the garage door. Mice, and other critters, like to enter through pet doors, too, so keep that in mind. Clean dryer vents. The best way to clean your dryer vent is to move it away from the wall, unhook the vent and use a vacuum. But that’s only half the job. Now go outside and use your Shopvac to clean the outside vent. This is something you should do every spring and fall – to prevent lint from clogging up your vent, which makes your dryer run longer, and to prevent a fire hazard. Inspect the Roof. Take a visual inspection of your roof. Your roof probably got a beating from summer thunderstorms and hail. Look for shingles that are damaged or missing. Schedule furnace maintenance. To keep your furnace in the best working order, have your HVAC company do a “preventative maintenance” check on your furnace. Your gas fireplace should also be cleaned before you use it for the first time this season: simply vacuum away any dust and cobwebs. 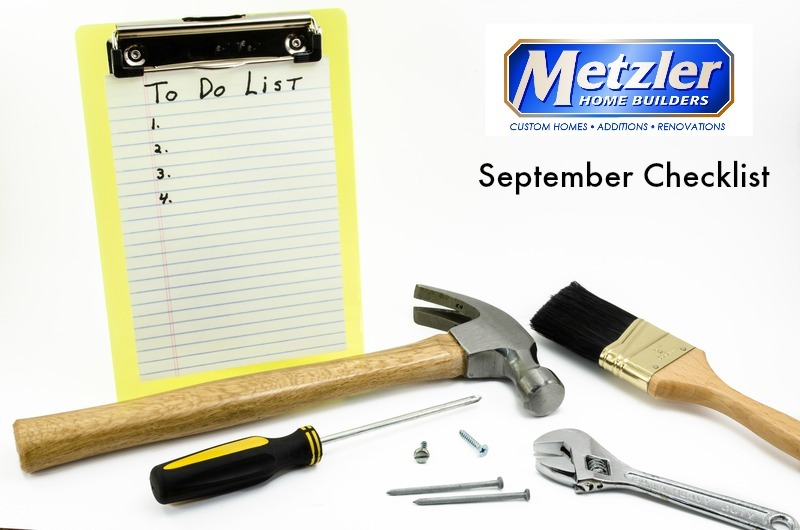 Posted in Home Tips on September 11, 2014 by metzler. How Secure Is Your Garage Door? Batteries and Filters and a Marker, Oh My!